After many years in various trades Kevin worked for ATI Rowley Operations and was a member of the team that took a new plant from a construction site to a fully operational production facility for the manufacturer of titanium. Kevin later worked for Rain for Rent in the Uintah Basin as Operations Manager for the Roosevelt branch renting water handling and fracking equipment and also providing the man power needed for setup and operations. He also worked with city utility’s and construction companies to meet their liquid handling needs. Kevin joined SSCG with 30+ years of management and construction experience. 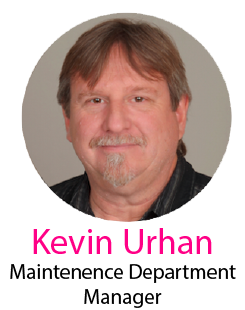 Kevin started as an Assistant Property Manager at Blue Ribbon Storage, until he was promoted to his current position as the maintenance department manager within SSCG. Kevin has two bachelor’s degrees in business management and marketing.